To view a volume snapshot you can use three different methods. Click or tap on the tab View (top), then click or tap on the button View Previous Versions. You will need to first expose the snapshot as a disk letter. See Exposing Volume Snapshots for instructions. A list of exposed snapshots will be shown. Click or tap on View next to the snapshot that you want to view. This will launch Windows Explorer and navigate to the root folder of the disk letter that is hosting the snapshot (for example, E:). Alternate method: Right-click (or press and hold down your finger) while inside of U-Recover. A pop-up menu will appear. Select Explore Files using Admin Rights. Navigate to root of the exposed snapshot (for example, E:). 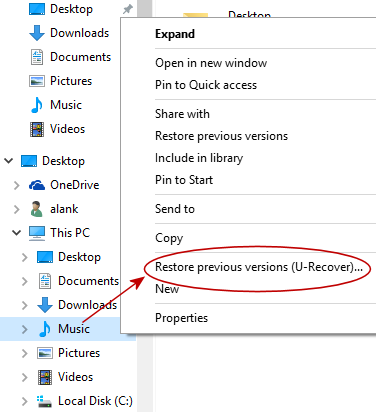 If you selected the installation option to Integrate U-Recover with Windows File Explorer you can view snapshots from inside of Windows Explorer using the right-click menu. Navigate to the folder that you want to view. While the cursor is hovering over the folder, right-click the mouse button (or hold your finger down). A popup menu will appear (see below). U-Recover will automatically start and select the tab Expose (top) and navigate to the panel for selecting which snapshot you want to view. Select the snapshot by assigning it a disk letter (for example, E:). Click or tap on Next, Expose, and View Snapshot. A new Windows Explorer window will open that will show you all of the shadow files in the folder that you had selected in step 2 above. If you check the box Keep the volume snapshot exposed, U-Recover will persist the temporary disk letter after you quit the application. The disk letter will remain exposed until you explicitly unexpose it (including across reboots). It will remain exposed until system drops the snapshot, for example if the reserved disk space fills up. Caution: Do not depend on the files in the snapshot to remain available indefinitely. The Windows operating system can drop a snapshot at any time without warning, even if it is exposed. For example, an unexpected crash or heavy workload can trigger the Volume Snapshot Service (VSS) to drop snapshots. Windows Explorer offers its own Previous Versions menu item in the popup menu (see above). The intent is to allow users with old snapshots that were created on Windows 7 or Windows Vista to be recovered on Windows 8 or later. You can also use the built-in menu to open an Explorer window to view the content of a snapshots created by U-Recover. The Microsoft built-in Previous Versions menu item has a significant limitation: You cannot view private files. You can only view files that are owned by yourself or that are public, even if you have full administrative rights on the computer. U-Recover exposes the snapshot as a disk letter. The snapshot looks exactly like a real read-only disk volume. This means that your administrative rights are honored exactly like on a normal disk volume, allowing you to view (and copy) all of the files in the volume snapshot.